Q: What's the maximum safe pressure I should try to put in a 2-liter bottle? A: A 2-liter plastic bottle will easily hold 100 psi without rupturing. Bottles of this size, that are in good condition, start rupturing at about 130 psi. Some go as high as 170 psi before they rupture. 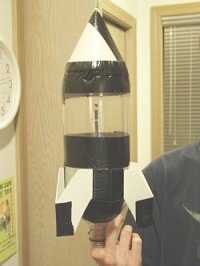 It is impossible to know when the bottle on your rocket will rupture without bursting it. Of course this would render the bottle unusable. It is also impossible to tell if the bottle has been damaged in a way that will lower it's burst pressure. Just repeatedly presurizing your rocket may also reduce its ability to hold pressure. For these reasons, you should always operate as if the rocket will burst during pressurization. This is why the safety code says you should presurize the rocket from a distance that is related to the operating pressure. "4. Compressed Gas Safety. A safe distance shall be maintained at all times between persons and pressurized water rockets or launchers. The recommended safe distance is as follows:"
The same energy that can propel your rocket to amazing heights can also be released in an explosion. Being too close when this happens, especially without eye protection, could ruin your whole day.